Attractive and extremely practical. Stores dozens of CD’s or DVD’s. House swivels 360 degrees on a lazy susan bearing. Back of project is fully open for easy access. House and stand are made from 3/4” pine. Window and door grids are made from 1/4” plywood. 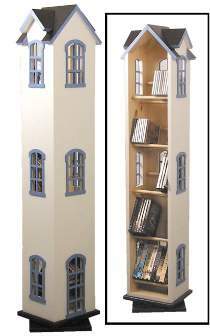 Each shelf consists of three wood dowels which support either CD’s or DVD’s. Project measures 57"H x 12.5"W x 9"D. Order one each #9C Lazy Susan Bearing and five each #7167 Birch Dowels separately.